Staubschutzfilter für 80mm Lüfter . Der FF121 ist zusätzlich mit einem Staubfilter ausgestattet. Er ist mit vier Schrauben auf einem 80-mm-Lüfter montierbar. Lüfter 40mm. Lüfter 80mm. Lüfter 60mm. Lüfter 70mm. Modell Nr. Staubschutzfilter für 120mm Lüfter . Der FF121 ist zusätzlich mit einem Staubfilter ausgestattet. Er ist mit vier Schrauben auf einem 120-mm-Lüfter montierbar. Lüfter 40mm. Lüfter 60mm. Ultrafeinporiger Filter für 120mm Lüfter . Ultrafeinporiger Filter bietet ausgezeichnete Staubreduzierung. SilverStone FF123B . Modell Nr. Staub kann der schlimmste Feind eines Computersystems werden, da durch ihn die Kühlleistung reduziert und bei übermäßiger Ablagerung Schäden verursacht werden können. SilverStone FF123W . Modell Nr. Ultrafeinporiger Filter bietet ausgezeichnete Staubreduzierung. Staub kann der schlimmste Feind eines Computersystems werden, da durch ihn die Kühlleistung reduziert und bei übermäßiger Ablagerung Schäden verursacht werden können. SilverStone SST-FF143W weiß, Staubfilter 140x140mm quadratisch. Verkäufer speichern. Silverstone Staubfilter 140 mm, SST-FF143B magnetisch Schwarzer Lüfter Filter. DEMCiflex Staubfilter 260mm x 80mm - schwarz/schwarz. SilverStone FF143W . Modell Nr. Ultrafeinporiger Filter bietet ausgezeichnete Staubreduzierung. Staub kann der schlimmste Feind eines Computersystems werden, da durch ihn die Kühlleistung reduziert und bei übermäßiger Ablagerung Schäden verursacht werden können. Staubfilter und Geräuschdämmung für 120mm Lüfter . Wer also die Reduzierung der Staubbildung zur Steigerung der Langlebigkeit von Komponenten mit erhöhter Kühleffizienz wünscht, trifft mit dem Staubfilter SST-FF124BY sicherlich eine ausgezeichnete Wahl. SilverStone SST-FG141 140mm RGB Lüftergitter. Integrierte 28-teilige RGB-LED-Leiste für brillante Lichteffekte. Lüftergitter 120 mm mit Filter - Silber. DEMCiflex 140mm, rund - schwarz/weiß Staubfilter Fanfilter, Lüfterfilter. SilverStone FF143B . Modell Nr. Ultrafeinporiger Filter bietet ausgezeichnete Staubreduzierung. Staub kann der schlimmste Feind eines Computersystems werden, da durch ihn die Kühlleistung reduziert und bei übermäßiger Ablagerung Schäden verursacht werden können. Silverstone Staubfilter 140 mm, SST-FF143B magnetischer Schwarz. InLine Filter Einbaukassette, 120 x 120 mm, Staubfilter für PC Gehäuse, Lüfter. Wer also die Reduzierung der Staubbildung zur Steigerung der Langlebigkeit von Komponenten mit erhöhter Kühleffizienz wünscht, tritt mit dem FF143 sicherlich eine ausgezeichnete Wahl. SilverStone FF122B . Modell Nr. Staubschutzfilter für 120mm Lüfter . Staub kann der schlimmste Feind eines Computersystems werden, da durch ihn die Kühlleistung reduziert und bei übermäßiger Ablagerung Schäden verursacht werden können. Lüftergitter 92 mm Schwarz Fan Grill für einen 92 mm Lüfter. Batterien dürfen nicht in den Hausmüll gegeben werden. Sie sind zur Rückgabe gebrauchter Batterien als Endverbraucher gesetzlich verpflichtet. With the FG122, any 120mm fan or fan mount can be turned into an RGB display source so users can freely choose the exact fan they want to use without being constrained by the limited number of RGB fan models. Convenient magnetized design for easy installation. Compatible with most 120mm fans or vents. Application 120mm size filter. Ultra fine filter provides great dust reduction properties. 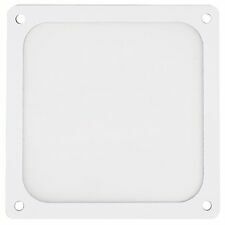 SilverStone SST-FF124BY, Staubfilter 120x120mm quadratisch. Silverstone SST-FF124BY Staubfilter - 120mm, Flacher schwarz-gelber Staubfilter mit von Silverstone. Lüftergitter 60 mm Schwarz Fan Grill, Lüfter Schutzgitter, Gitter. Part Number: FF142B. But most fan filters are a hassle to install so Silverstone created an easy to use FF142 fan filter. Its 140mmx2 size is compatible with most fan vents so it can be used in many places that require filtering. The FF81 is a fan grille designed for easy installation with any 80mm fan. The honeycomb pattern on the grille not only reduces wind shear noise but also channels the airflow into more focused beam. SilverStone SST-FG121 120mm RGB Lüftergitter. Integrierte 24-teilige RGB-LED-Leiste für brillante Lichteffekte. Lüftergitter 92 mm Schwarz Fan Grill für einen 92 mm Lüfter. Batterien dürfen nicht in den Hausmüll gegeben werden. With the FG142, any 140mm fan or fan mount can be turned into an RGB display source so users can freely choose the exact fan they want to use without being constrained by the limited number of RGB fan models. The FF121B is a fan grille designed for easy installation with any 120mm fan. The honeycomb pattern on the grille not only reduces wind shear noise but also channels the airflow into more focused beam. Part Number: FF81B. Manufacturer: SILVERSTONE. The FF81 is a fan grille designed for easy installation with any 80mm fan. The honeycomb pattern on the grille not only reduces wind shear noise but also channels the airflow into more focused beam. Silverstone SST-FF124BY Staubfilter - 120mm, Flacher schwarz-roter Staubfilter mit von Silverstone. Batterien dürfen nicht in den Hausmüll gegeben werden. Sie sind zur Rückgabe gebrauchter Batterien als Endverbraucher gesetzlich verpflichtet. Ultra fine filter provides great dust reduction properties. Application 120mm size filter. Convenient magnetized design for easy installation. Lüftergitter 92 mm Schwarz Fan Grill für einen 92 mm Lüfter. Anzahl unterstützter Lüfter. Batterien dürfen nicht in den Hausmüll gegeben werden. Sie sind zur Rückgabe gebrauchter Batterien als Endverbraucher gesetzlich verpflichtet. With the FG121, any 120mm fan or fan mount can be turned into an RGB display source so users can freely choose the exact fan they want to use without being constrained by the limited number of RGB fan models. But most fan filters are a hassle to install so SilverStone created an easy to use FF141 fan filter. Its 140mm size is also compatible with most 120mm fan vents so it can be used in many places that require filtering. But most fan filters are a hassle to install so SilverStone created an easy to use FF122 fan filter. In addition to filtering dust, the FF122ï¾’s grille can reduce noise associated with air turbulence. 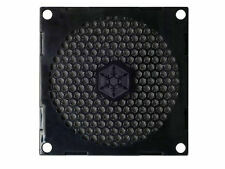 Silverstone 120mm Magnetized Fan Filter - Brand New! Design is rigid plastic, and while the filter is supplied with screws for mounting, it is also magnetized if you prefer it easily removable. Not a great deal to say about this, bought for a PC Build, but never used, a Silverstone 120mm fan filter. In addition to filtering dust, the SST-FF141B grille can reduce noise associated with air turbulence. So for those looking for dust reduction for component longevity with increased cooling efficiency, the SST-FF141B is an excellent buy. 120 mm fan cover from Silverstone with filters and honeycomb structure to focus the Airflows. Compatibility: 120 mm fan. Can also be fitted to a standard 140mm mount. 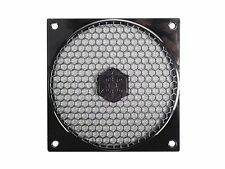 Silverstone 120mm Fan Grill And Filter Kit Honeycomb grille increases airflow focus Integrated filter provides class leading dust reduction Highly compatibility with all 120mm fan Welcome to our Shop! But most fan filters are a hassle to install so SilverStone created an easy to use FF143 fan filter. Its 140mm size is also compatible with most 120mm fan vents so it can be used in many places that require filtering. Silverstone Tek 140mm Ultra Fine Fan Filter with Magnet Cooling FF143B (Black). But most fan filters are a hassle to install so SilverStone created an easy to use FF143 fan filter. Its 140mm size is also compatible with most 120mm fan vents so it can be used in many places that require filtering. 1x SilverStone SST-FF143B. ultra fine 140mm Fan Filter w/ Magnet. Compatible with most 140mm fans or vents. Ultra fine filter provides great dust reduction properties. We will only use these information for the purpose of fulfillng the order. 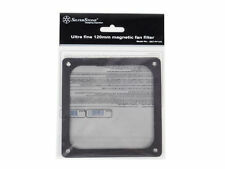 Convenient magnetized design for easy installation Ultra fine filter provides great dust reduction properties Compatible with most 120mm fans or vents Dust can be a computer system's worst enemy as it has the potential to lower cooling performance or cause damage when left overly accumulated. But most fan filters are a hassle to install so SilverStone created an easy to use FF123 fan filter. The FF123 has embedded magnet in its frame so it can be effortlessly attached to any steel chassis without tools. So for those looking for dust reduction for component longevity with increased cooling efficiency, the FF123 is an excellent buy. 1x SilverStone SST-FF143B. ultra fine 140mm Fan Filter w/ Magnet. Compatible with most 140mm fans or vents. Ultra fine filter provides great dust reduction properties. Convenient magnetized design for easy installation. 1x SilverStone SST-FF143W. ultra fine 140mm Fan Filter w/ Magnet, white. Compatible with most 140mm fans or vents. Ultra fine filter provides great dust reduction properties. 1x SilverStone SST-FF143B. ultra fine 140mm Fan Filter w/ Magnet. Compatible with most 140mm fans or vents. Made with vibration-absorbing silicone material for up to 4dBA noise reduction. ultra fine 120mm Fan Filter w/ vibration-absorbing. Designed to fit tightly with standard 120mm fan mounts. 1x SilverStone SST-FF143B. ultra fine 140mm Fan Filter w/ Magnet. Compatible with most 140mm fans or vents. Ultra fine filter provides great dust reduction properties. Silverstone SST-FF143B - SST-FF143B Magnetic Dust Filter - 140mm FF143B . Compatible with most 120mm fans or vents. Ultra fine filter provides great dust reduction properties. Color: SST-FF123W. Date First Available: 29 Aug. 2013. Product gallery. Series: SST-FF123W. Compatible with most 140mm fans or vents. Ultra fine filter provides great dust reduction properties. Color: SST-FF143W. Date First Available: 29 Aug. 2013. Product gallery. Series: SST-FF143W. Compatible with most 140mm fans or vents. Ultra fine filter provides great dust reduction properties. Color: SST-FF143B. Date First Available: 26 April 2013. Product gallery. Series: SST-FF143B.